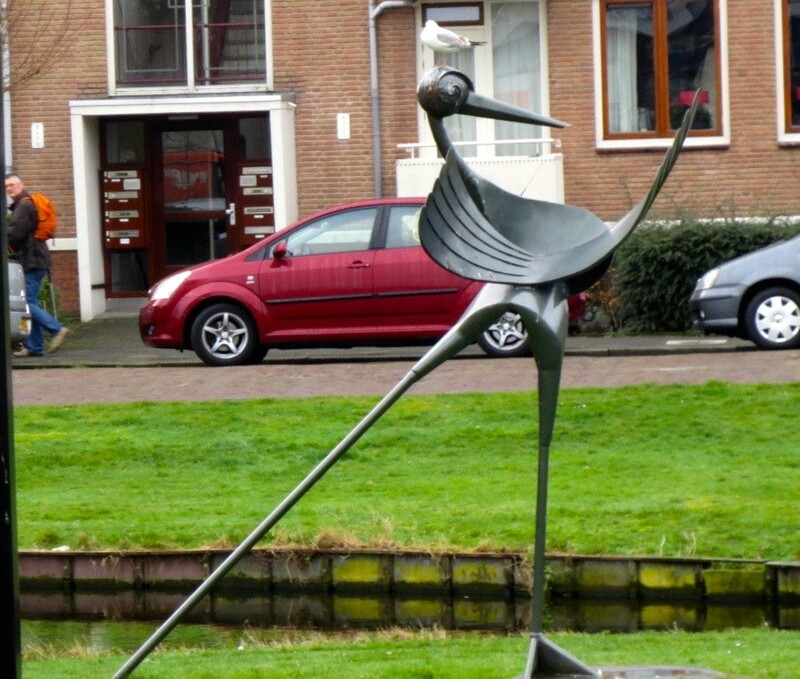 Word of the Day: MEEUW, gull – Welcome to the Direct Dutch institute, The Hague. In the early sixties the whole wide world was shocked by Hitchcock’s horror movie hit ‘The Birds’. Because I was only ten, I wasn’t allowed to see this macabre film, but I heard terrifying stories of men and women being chased and violently attacked and even killed by waves of gulls and crows. Because of Hitchcock (what’s in a name?) and this thriller, birds had lost their innocence forever for me. Hitchcocks impressive tribute to our feathered friends can be found here. 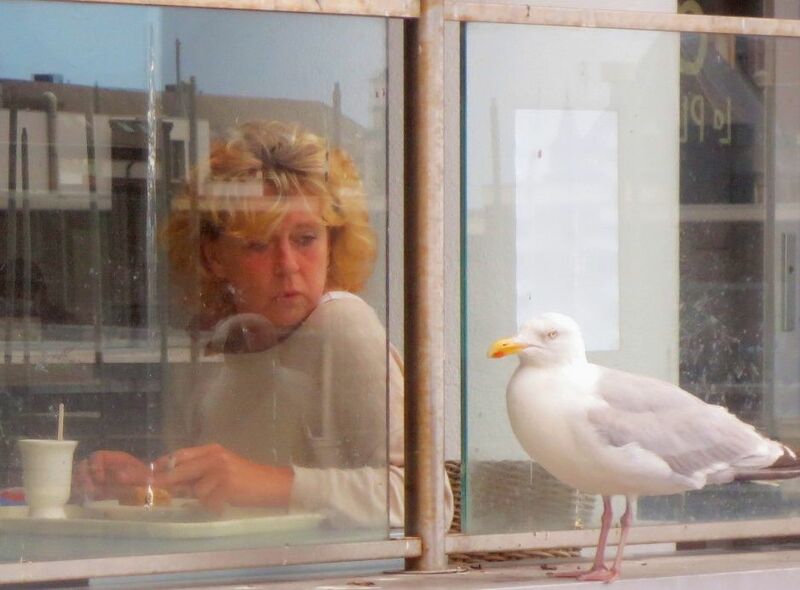 In those days I had a close encounter with gulls. The father of my best friend Edgar was an enthusiastic bird watcher. Early one morning in spring he took us birding in the dunes between Scheveningen and Wassenaar. Edgar’s father gave each of us a stick. 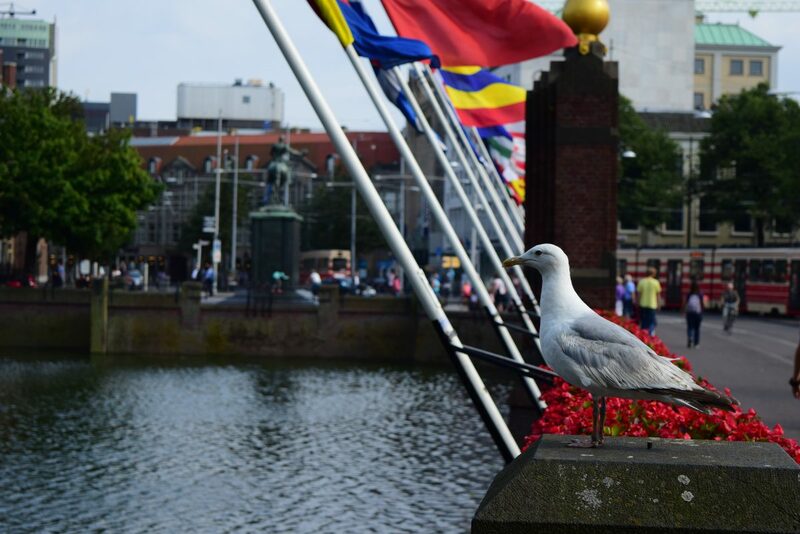 ‘De meeuwen broeden,’ (the gulls are brooding) he whispered ominously: ‘They don’t like people near their nests’. But then he smiled reassuringly: ‘When they attack, just hold your stick up high, for gulls always attack the highest point’. Apparently, birding was not as harmless and boring a hobby as I had imagined it to be. Sitting gulls can be aggressive and will attack if you approach their nests. There we were in the cold morning sun. Edgar and I were about to play our roles in a scene that Hitchcock could have designed for ‘Birds II’. We walked and walked through the dunes and along the beach, but the gulls left us alone and we never had to use our sticks. What a disappointment. Fifty years later, I remember my one and only birding adventure and still feel that sensation of imminent danger. These large gulls that attack so aggressively, are called ‘zilvermeeuwen’ (herring gulls). The birds fled from the dunes because foxes ate their eggs when they were put out by nature lovers in the eighties of the previous century. 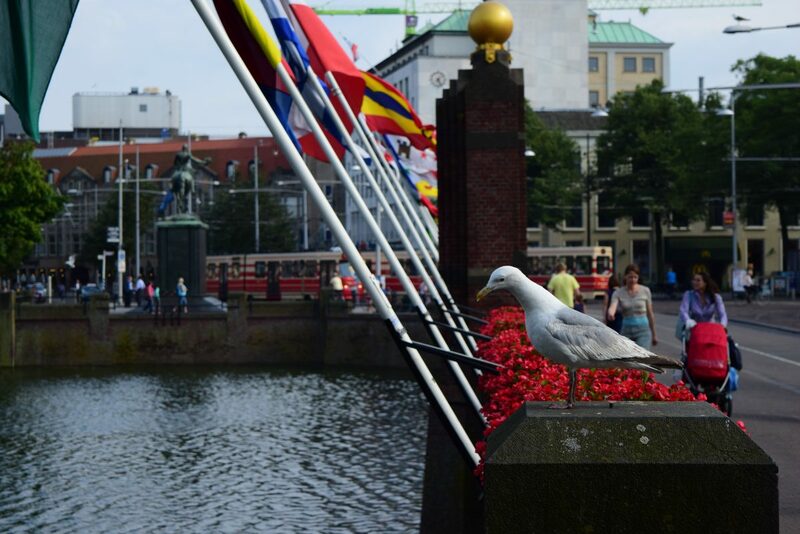 Gulls have been prowling around The Hague ever since. They nest on flat roofs in the city because the surfaces are covered with gravel and look like the gulls’ natural dune habitat. The sea is too far now and that’s why the birds rip open garbage bags in search of food. In the centre of The Hague fish shop Simonis has a notice warning their herring eaters that they should eat their fish underneath the sunshade where the gulls cannot attack from the sky. Hagenaars call these robber-gulls ‘luchtratten’ (flying rats). Gulls don’t deserve this abusive name. They are beautiful wild hunters and kings and queens of the sea and the sky along the coast. These aristocrats should return to their natural habitats because they weren’t born to be citydwellers. The word MEEUW also exists in Great Britain where the bird is known as ‘gull’. Gull is one of the few Celtic words that managed to invade the Anglo-Saxon language. In Welsh the bird is known as ‘gŵylan’, in Cornish ‘guilan’, in Breton ‘goelann’ (in French ‘goéland’), in Old Irish ‘foilenn’ and in modern Irish ‘faoileann’. The Breton word ‘goelaff’ means ‘to weep’; so is a ‘gull’ a weeping bird? And is there a connection with old myths which have it that gulls are reincarnated souls of drowned sailors. Apparently Shetlanders still use the word ‘maw’ instead of ‘gull’, the Scots and English sometimes use the word ‘mew’ and in North America there are ‘mew gulls’. In Germany they call the MEEUW, ‘Möwe’. According to etymologist Ms Nicoline van der Sijs the word was written down in Dutch in 1287 for the first time. Etymologists have no idea what the exact origins are of the word MEEUW (maw, mew, möwe). Does it go back to old Germanic words meaning ‘blue’ or ‘brash’ or ‘cheeky’? The word MEEUW resembles a cat’s ‘miaow’ and in Frisian the word is even spelled as ‘meau’ or ‘mieu’. So the sound of the word could be an echo of the gull’s cry. Another theory is more to my liking. In Old Norse the word for gull ‘mær’ also means ‘slim’ or ‘narrow’ and this could refer to the elegant shape of the bird. and brood stony broke on gravel roofs. snarls black-headed gull at her. Give expats in The Hague the opportunity to speak Dutch!